My double life went on until the night Ipek asked me if there was another woman. I burst into tears and told her everything. She cried too. 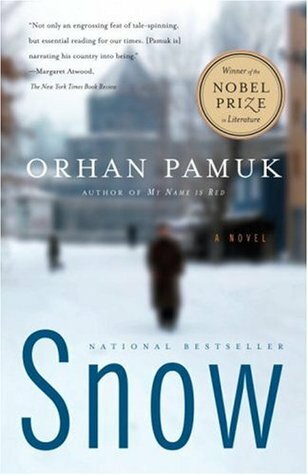 About Snow by Orhan Pamuk: Dread, yearning, identity, intrigue, the lethal chemistry between secular doubt and Islamic fanaticism–these are the elements that Orhan Pamuk anneals in this masterful, disquieting novel. An exiled poet named Ka returns to Turkey and travels to the forlorn city of Kars. His ostensible purpose is to report on a wave of suicides among religious girls forbidden to wear their head-scarves. But Ka is also drawn by his memories of the radiant Ipek, now recently divorced. Amid blanketing snowfall and universal suspicion, Ka finds himself pursued by figures ranging from Ipek’s ex-husband to a charismatic terrorist. A lost gift returns with ecstatic suddenness. A theatrical evening climaxes in a massacre. And finding god may be the prelude to losing everything else. Touching, slyly comic, and humming with cerebral suspense, Snow is of immense relevance to our present moment. Here's a book I have ready for three of my reading challenges. Written by Nobel Prize for Literature Laureate Orhan Pamuk, this is set in Turkey. Very poetic beginning ... and quite apt. Tons of snow in my part of the world. Have great Friday and weekend to come!